The mix of bacteria (microbiome) of bee bread, the long-term food supply stored within a hive for young bees, is now at risk, according to a new estimate. The scholars are blaming modern monoculture farming, commercial forestry and gardeners could be making it harder for honeybees to store food and fight off diseases, a new study suggests. Human changes to the landscape, such as large areas of monoculture grassland for livestock grazing, and coniferous forests for timber production, is affecting the diversity of the ‘microbiome’ associated with honeybees’ long-term food supply, the authors claim. Bees use bacteria to turn fresh pollen into a long-term food store and to help them fight off infectious diseases. Bacteria can act as a preservative for bee bread within hives. The authors suggest that without an undefined yet diverse microbiome the bee bread can be more vulnerable to mold, causing a food shortage for the hive. Bees pick up different strains of bacteria from plants when they are foraging for food so the notion that this could be a human-induced problem is controversial, though welcome for environmental groups who have contended that pesticides, like neonicotinoids, are causing bees to die off. 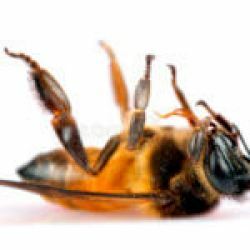 This study will allow them to try and keep emotions high by arguing that bees just haven't died off yet, but they will if pesticides cause changes to the microbiome; the blank "sub-lethal" suggestion, which is like the claims of endocrine disruption from trace levels of harmless chemicals in humans. The authors used Illumina MiSeq DNA sequencing and denaturing gradient gel electrophoresis – to identify the microbial communities of nearly 500 bee bread samples taken from 29 honeybee hives across North West England. They found that hives located near urban landscapes demonstrated lower diversity in the microbiome of bee bread. And they place some of the blame on people trying to help bees by growing a range of pollinator-friendly flowers, but because they don't understand ecology they pick plants from around the world, which could be harming bees. Native bees, their forage plants and the bacteria located within have evolved together and the bacteria bees pick up from non-native plants may be less likely to be beneficial to the hive.